High School Pranks: 8 great prank ideas to try in your classroom. Are you bored in class and itching to try out a few high school pranks? Here are 8 for you to try. Most are designed for the solo prankster, and best set up when the teacher is out of class! 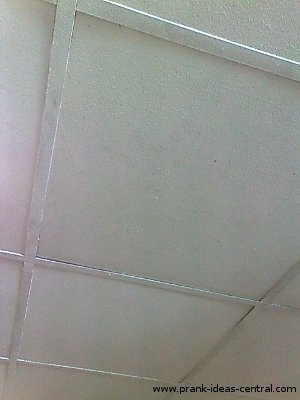 This prank will only work if your classroom has a dropped ceiling (as shown above). The idea is to shift the dropped ceiling closest to the teacher's table aside and place a walky talky or a radio inside. If you're using a walky talky, make sure both are on and tuned to the same communication frequency. If you are using a radio, get a wireless microphone and make sure both devices are tuned to the same frequency. Naturally, you should test that both devices can communicate before planting it in the ceiling. You'll need your entire class to be accomplices, if possible. The student at the back (or outside the class) will be the mysterious voice in the ceiling, using the other walky talky or the microphone. If your teacher asks if anyone hears something in the ceiling, just get everyone to stare at her as if she's crazy, and one of you should just say no. Give intermittent 'religious commandments', e.g. 'thou shalt go for a toilet break now'. If you have a classmate who sleeps a lot in class, tug away his or her desk in one smooth motion. If your victim is in a deep sleep, chances are your victim will just fall to the floor. I kinda personally like this high school prank for it's simplicity and hilarity. The problem is that there's a chance of injuring more than the pride of your poor victim. It's great to play if your classroom has a carpeted floor, but again, there's a risk of injuring your victim. This is another high school prank for sleepers in class who rub their face with their hands when they wake up. Take your deep sleeper's hand (the one they usually use to rub) and stain it with an inkpad. Usually the wetness of the pad will wake them up, but if it doesn't, you might as well stain the second hand too, if possible. Otherwise just wake your victim up. Be sure to let them find out that something's on their face on their own. This high school prank is a variation of the bucket at the top of door prank. Typically the bucket is filled with water as shown in the video, but in this case you need to fill the bucket with glue. Once your victim steps in and gets some glue on them, throw a bucket full of feathers at them. A hilarious and messy prank for sure. If your victim is engrossed in a book, better yet with a portable music player on, you can easily sneak up behind them and dangle a toy spider in front of his or her face. Get ready to laugh at the freaking out that will ensue from this high school prank. For this high school prank, you'll be ideally hitting your victim with a series of prank whammies. First, use blackboard chalk the stain the seat of your victim's chair. If your victim sits on it, you have hit one, but it's not the main point. The point of chalking the chair first is to get your victim to let his or her guard down. That is to say, if your victim sees the chalk on the chair again, he or she is going to assume that you're trying the same trick twice. You can try chalking just the chair a few more times until your victim becomes very wary of a chalky seat. The next part of the prank really depends on how your victim interacts with the table while sitting down. Does your victim's legs have contact with the underside and sides of the table? Does he or she inadvertently rub the table legs with their own? Once you know where they normally contact with the table, you're ready for your next strike. On the next strike, chalk you victim's chair seat once again, but this time you will also chalk the areas that your victim's legs come into contact with as well. Be sure that the locations you choose to chalk are reasonably out of your victim's view. Your victim will be likely to notice the stain on the chair and give you a 'nice try' look before cleaning it off. Then your victim will likely just sit down and carry on without noticing that his or her legs are being stained with chalk from the table. Have fun. This is the most satisfying prank I've played on someone so far. This is one of my favorite pranks. I managed to tie my schoolmate's laces together while talking to him. It takes a lot of skill and subtlety to pull off as your victim will probably be able to feel you tugging at the laces. If you do have a victim who does not double lace their shoes, you're probably in luck. To pull off this prank successfully, you'll need to be sitting in front of your victim's desk, with your victim behind it. Make it a habit to regularly to face your victim and talk while resting your head on one hand on your victim's table. Let your other hand dangle downwards and make it seem like you're resting naturally. Make sure you maintain eye contact throughout these conversations. You'll need to do this without pulling the prank for a few days if you have not been regularly doing so to condition your victim for the prank. Meanwhile, practice tying a knot on two ends of a string with one hand. Tying a granny knot or reef knot (see the video above to learn how) will do the trick nicely. On the day of the prank, converse normally with your target in your 'resting' posture, and ever so gently loosen the laces of your target. Then tie the laces of the two shoes together in a dead knot with your free hand while maintaining eye contact with your victim. With practice, you'll successfully topple 1 or 2 classmates with this prank. This is a simple high school prank, but a really amusing one. Spread a thin layer of glue on your victim's chair to blend in with the texture of the chair. In other words, use a brush to roughen it to match a matte finish, or leave it smooth to match a glossy finish. You'll need to make sure you apply the glue close to the time when you expect your victim to sit on it, otherwise the glue will dry out before the deed is done. Of course, how long you have before the glue dries up depends on the type of glue you use. Experiment with a few types and see.